Age Group: Under 8 years because of ceiling height and size of unit. 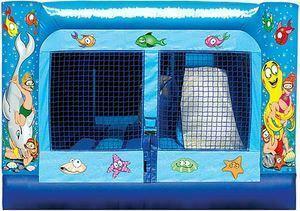 3in1 Mini Under The Sea under 7 yrs Combo Jump, Climb, and Slide. Kids 3-7 years only. Laugh at the weather, snicker at the storm bring the party indoors if you want to or stay in the glorious outdoors! Jump with your friends, Climb the hill and slide in the 3 in 1 Mini Under The Sea Adventure Fun House Combo! Up to 6 children ages 3-8 years old may in this unit at one time.